EU Ambassador to Israel Emanuele Giaufret, together with the Kantor Centre for the Study of Contemporary European Jewry today hosted an event commemorating International Holocaust Remembrance Day. 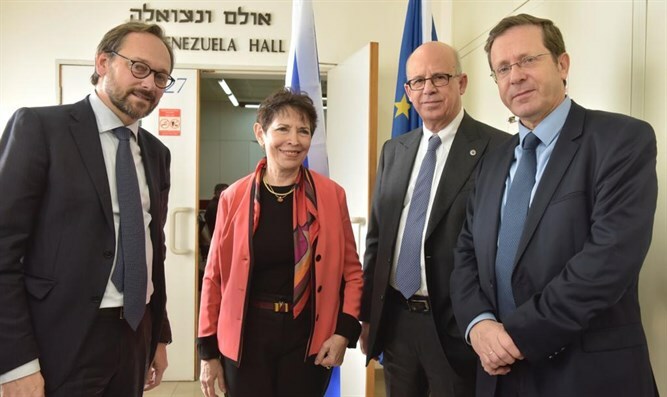 The event was attended by Tel Aviv University President Prof. Joseph Klafter, Jewish Agency Chairman Yitzchak Herzog, and Prof. Dina Porat, together with ambassadors of the European Union member states. Today's event is one of a series of events taking place in Israel and in Europe to mark International Holocaust Remembrance Day. EU events to commemorate this day take place in Brussels, including an annual training seminar by the European Commission on The Holocaust and Fundamental Rights in cooperation with the House of the Wannsee Conference. International Holocaust Remembrance Day is an international memorial day designated by the United Nations on 27 January to commemorate the tragedy of the Holocaust that occurred during the Second World War. It is dedicated to remembering the genocide that resulted in the death of an estimated 6 million Jewish people by the Nazi regime and its collaborators, and marks the day of the liberation of the Auschwitz-Birkenau concentration and death camp. International Holocaust Remembrance Alliance in November 2018. "This commitment begins with protecting and safeguarding the freedoms of our living European Jewish communities and citizens. This responsibility belongs to our governments and citizens, and we will 'never again' abandon the Jews to suffer this alone."